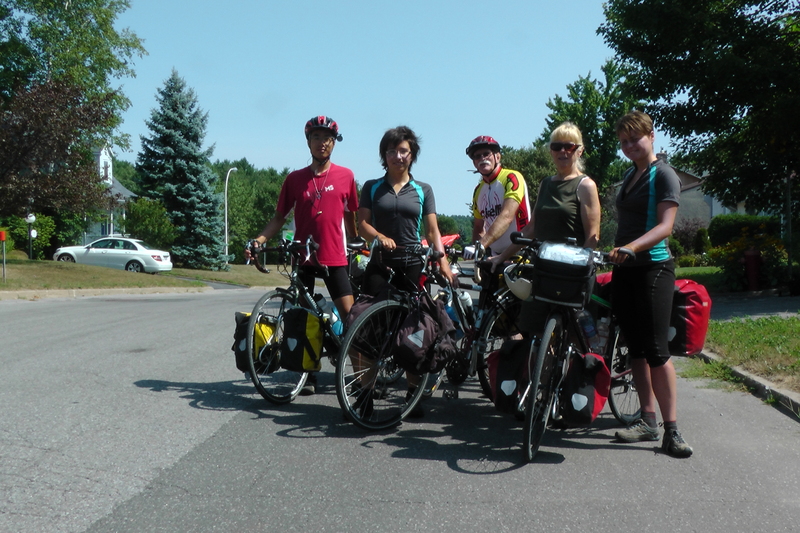 After cycling all across the country, what did we find out about sustainability in Canada? We spoke with over 50 people across the 10 provinces. Our encounters were amazingly varied, and each story was unique. We were inspired! Many Canadians we met are acting to move towards sustainability. Some of them don’t necessarily associate their actions with sustainability; others are aware of the way their actions fit into the sustainability picture. It is amazing that, even without seeking out “sustainable people,” we came across so many relevant initiatives. Now, we can step back and look at the big picture, looking for patterns in the stories we collected and making some generalizations about the Canadian perspective on sustainability. Here’s what we found. Q: What did one garbage can say to the other? Many Canadians are concerned about the vicious cycle of consumerism: work more, buy more, want more things, repeat. But once people are aware of it, they are better equipped to break free. Randy from Newfoundland sees this happen to people who go to work in the oil sands. Although he has worked in Fort Mac himself, he knows his limits: he won’t buy a skidoo or a big truck if he doesn’t need one! There’s also concern about another side of consumerism: excessive production is detrimental to the environment and creates a lot of waste. Emily from Saskatchewan was inspired to minimize her own consumption: she re-uses things by shopping at thrift stores and garage sales. At the Nelson Food Co-op in British Columbia, a documentary about waste inspired the members to vote for banning plastic bags in the store. That’s 10 000 members reusing their bags every time they shop! Charlie from Nova Scotia used all reusable dishes and cutlery when she hosted an event for 200 people to reduce waste from single-use eating utensils. Lots of people had concerns about money draining from smaller communities and businesses to large corporations. Co-operatives offer one solution: they follow a business model that can be accountable to the communities they serve. In Grand Forks, British Columbia, a food co-op has re-started, providing an alternative to shopping at the chain stores in town. By connecting the residents with the local farmers and making the price fair to both farmer and customer, the co-op is improving the local economy. We found many other, similar food co-ops as well. For example, the Penokean Hills Farms co-op in Ontario is helping cattle farmers to butcher and sell their meat locally. In some places, people were concerned about a lack of jobs in their area. The Bear Claw First Nations casino and hotel in Saskatchewan is a striking example of a community creating jobs for itself. The White Bear First Nations fought hard to make the resort a reality. Now it employs a large part of the community. The business is run by community members whose mandate is to keep the community in mind, providing income, job training, and funding for community projects. We also encountered a radically different solution to the jobs issue: people in Hutterite colonies live communally. Everyone helps out, and everyone gets what they need. Many Canadians are growing their own food. We’re not talking herb gardens: people manage to feed themselves, at least for most of the season. The Thiessens from Saskatchewan grow their own vegetables and only rarely need to buy food. Justin in Ontario grows vegetables and raises chickens on his permaculture farm. Gabriel in Quebec raised his own goat. Marianne from Prince Edward Island grows enough vegetables for 3 households and shares her harvest with her neighbours. Rose in Nova Scotia is fattening up two pigs for the winter. Kevin in Nova Scotia eats the mackerel he catches from his kayak and the organic vegetables he trades for his excess mackerel. If you’re lucky like Bridget in Newfoundland, and you have friends who are hunters, then you are guaranteed to have moose meat feasts for a while. A significant number of people strive to be self-sufficient with their electricity and energy needs. This is especially true in Ontario, where we saw solar panels everywhere. Thanks to Ontario’s government subsidies and the FIT program, people see solar panels as an investment and even a source of income. Pat and Sherri, for example, have enough solar panels to supply them with 110% of their annual electricity needs. Several people we met were self-sufficient for their water needs. At the permaculture farm in Ontario, a pump connected to a solar panel channeled water from Lake Huron to the house and garden. Dany and Maite in Quebec draw water from a well for household use, and obtain their drinking water from a nearby spring. A: It can go wherever it @#*&ing wants, it’s a free-range chicken! In Calgary, Alberta, Maria was buying some free-run eggs at the grocery store and the guy behind her in line commented to the cashier about how ridiculous the term sounds in French. They had a full 15-minute discussion about it in franglais. But many people we met were much more interested to know how their food was produced and where it came from. A lot of people care about staying healthy, and one way they can improve their health is by eating better. Fresh, organic fruit and vegetables are important. Equally important is dairy, fish and meat produced in a healthy environment where animals are fed quality feed without antibiotics or growth hormones. Whether through local food co-ops and farmers’ markets or by growing their own food, many people we met found ways to obtain healthier food. Several times the topic of vegetarian vs. meat diet came up – which is healthier? Jesse from Quebec became mostly vegetarian after moving to the city from his parents’ organic cattle farm. Fresh organic meat was in abundance when he was growing up but that was not so much the case once he moved to the city. On the other hand, Dwight who used to be vegan started eating local meat and dairy when he moved to Vancouver Island, British Columbia. When choosing between highly processed, genetically-modified soy products from overseas and fresh organic meat from across the street, Dwight prefers the meat. Some people do encounter challenges with trying to eat healthy food. Everyone seemed to know the story of a couple in Quebec that transformed their front yard into a beautiful vegetable garden, but due to a ridiculous bylaw they were told by the municipality to tear down the garden or face a severe fine. A campaign was launched to save the garden and recent news celebrate their victory! Though it was an intense struggle for the couple, the campaign was all over the news and raised a lot of awareness, which brings us to our final category. Spreading the message about living more sustainably can be a challenge. In some cases, information is not readily available: in New Brunswick, where the Irving family has a monopoly on the forestry and newspaper businesses, news is often biased. Several media co-ops have started up, providing people with a more objective and complete story. Even when the information is there, it is not always easy to get people to listen. As Jesse from Quebec told us, those who work in inherently unsustainable professions, like mining and oil extraction, avoid the topic because they don’t want to be blamed or feel like they’re doing something wrong. 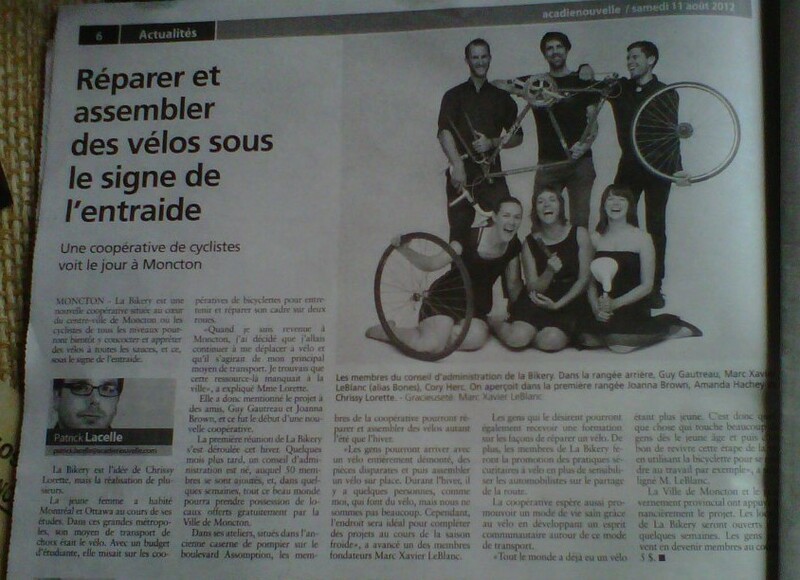 Others, suggests Dany from Quebec, are just resistant to change and don’t dare to do something different. Aaron in Manitoba says that some people are just lazy. At the same time, we did find several educational initiatives on our way, where dedicated people are taking on these challenges. Aaron in Manitoba started a sustainable campus group at the University of Manitoba to network and share knowledge among students. 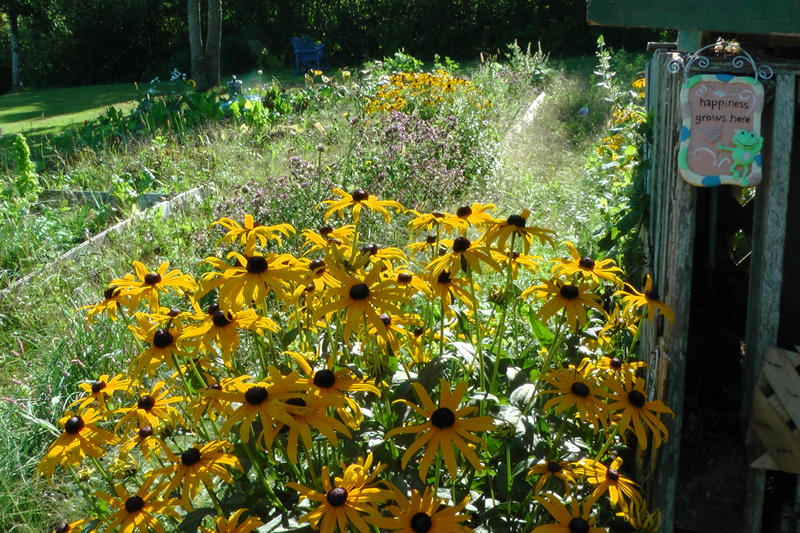 The permaculture farm on Manitoulin Island in Ontario holds permaculture design courses. Pat in Ontario teaches sustainable building design at Fleming College. 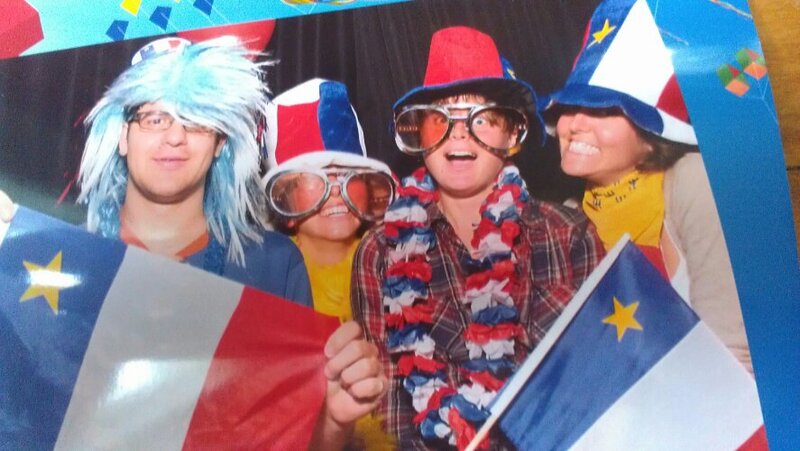 Sustainable Antigonish in Nova Scotia invites guest speakers and sets up movie nights to raise awareness and share knowledge. We also met parents who are passing on knowledge and values to their children. Charlie in Nova Scotia is teaching her kids about growing vegetables. Dany and Maite in Quebec are teaching their son Mateo about re-using by making crafts out of cereal boxes. So many good things are happening all over Canada. Our project is not a scientific paper: we are not claiming to have gathered an unbiased statistical sample showing the current trends. But every story described and every person encountered is real. We hope that the stories we shared have informed and inspired our readers as much as they inspired us. In Vancouver, when you have a ferry reservation you need to show up a half hour before it leaves. In North Sydney, it’s two hours! We became aware of this minor difference 70 minutes before scheduled departure time and with 30 minutes of cycling still ahead of us. To add to the fun, our reservation was only for 1 bicycle. We had to go through a complicated cancellation and re-booking process while the attendant radioed to the ferry guys to wait for us. It all worked out in our favour, and although we love an epic tale for the blog, we’re happy that we weren’t delayed another unspecified number of days. This is the final round: our 10th and last province. Let’s review the wildlife scores. Bear sightings are 4-2 with Anya taking the lead. Moose sightings are 2-0 with Anya again in the lead. Since Newfoundland is famous for its large moose population, Maria has a fighting chance to see one before she flies home. Though the scores will likely still be in Anya’s favour, Maria is on a mission to improve her moose sighting score from nil to at least one. We’re moving fast, but the seasons are moving faster. 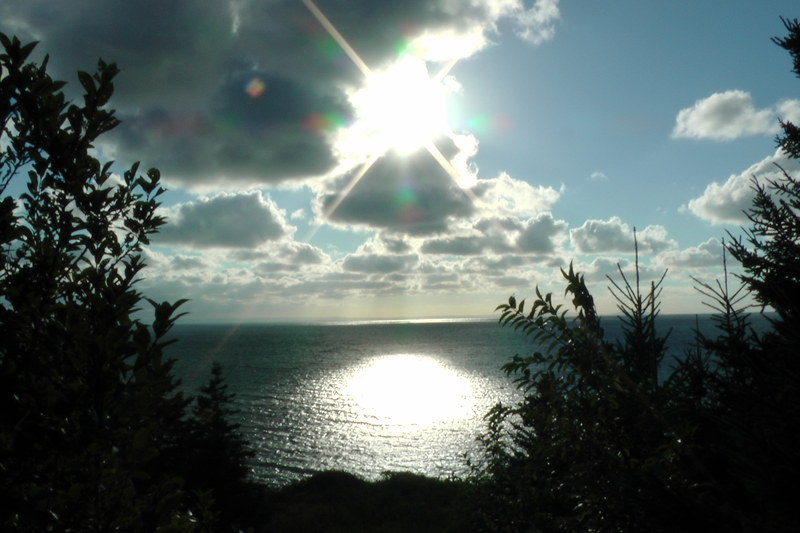 Fall has arrived in Newfoundland: it’s colder, and the days are getting noticeably shorter. The cold is pleasant, for now. As for the daylight, we need to budget our time accordingly and leave on time in the mornings. Also, Newfoundland is on its own, special time zone. 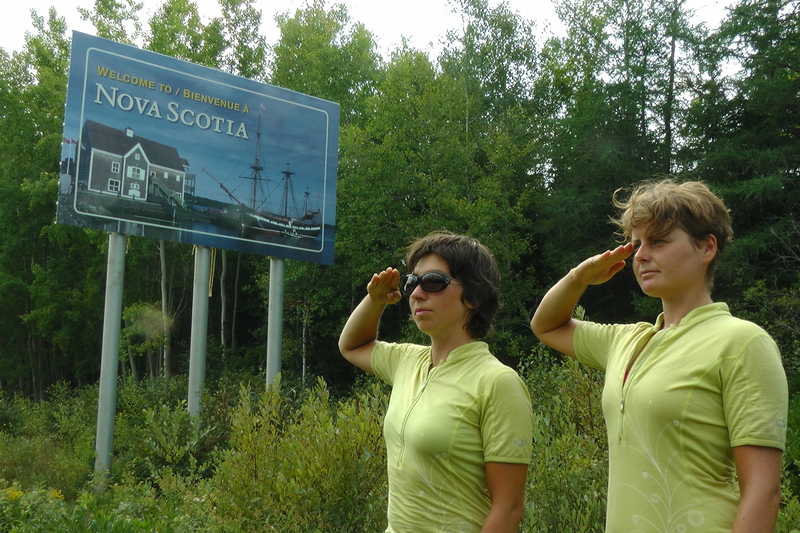 The time here is not an hour, but just a half an hour later than Nova Scotia. With the ferry arriving an hour later than expected, we did not have a lot of daylight time to cycle. We camped in JT Cheeseman Provincial Park, just 10km off the ferry. In Ontario we would always avoid the provincial parks due to the insanely inflated prices. But we were pleasantly suprised: camping was only $15 a night, there was a hot shower, and each site has its own blue box for recycling! The next day the forecast was not promising. We had breakfast at the beach and enjoyed the majestic view of stormy clouds. As we were leaving, the rain started coming down a bit. To our surprise, the storm never caught up to us. 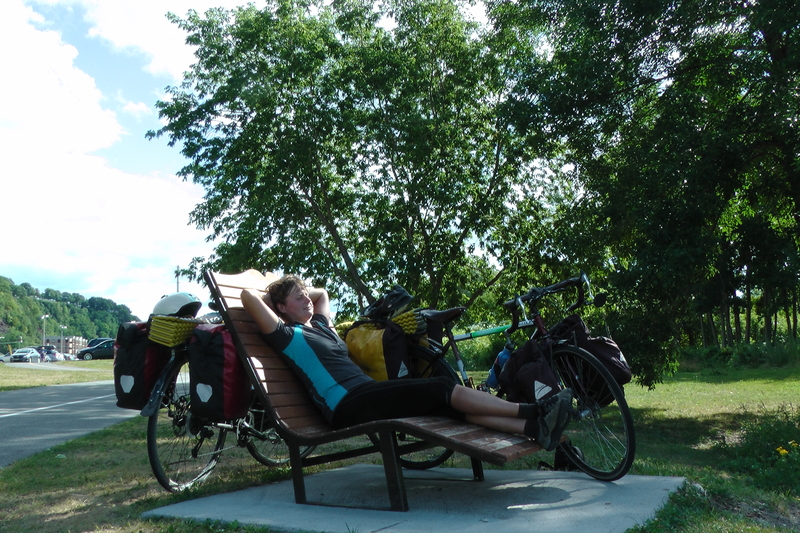 We cycled with the the wind blowing at our backs and did the 144km to the Barachois Pond Provincial Park with no problem. The day after, though, the weather gods figured we needed a thorough wash. Perhaps they thought we needed a blow-dry as well, because we got massive headwind. Somebody should tell the weather gods that blow-drying is usually after, not during, a shower. We hadn’t used rain pants in a while and of course forgot to put them on at the relevant time. Cold, wet, hungry, and more tired than one might expect, we stopped at the first restaurant we came across. We had covered just over half of what we had to do in total that day. We really didn’t want to go back out and face the elements but the restaurant had no wi-fi and we needed to post. (Be grateful as you peruse our writings from the warm comfort of your favourite armchair.) Besides, we had a couchsurf set up for that evening and needed to make the distance. This time we used our rain pants — an improvement, although not total relief. “Waterproof breathable” is an oxymoron. Wi-fi was available just 15 km further, in Corner Brook. We drank gallons of warm beverages at Brewed Awakening, the coffee shop beside a bike shop. By the time our blog was posted, it was really time to get moving. Just then, the clouds parted and the rain stopped. How glad were we about couchsurfing that evening? Words can hardly express it. We were staying with Bridget, although we had originally contacted her daughter through Couchsurfing. Bridget’s daughter was out camping, so Bridget offered to take us in. 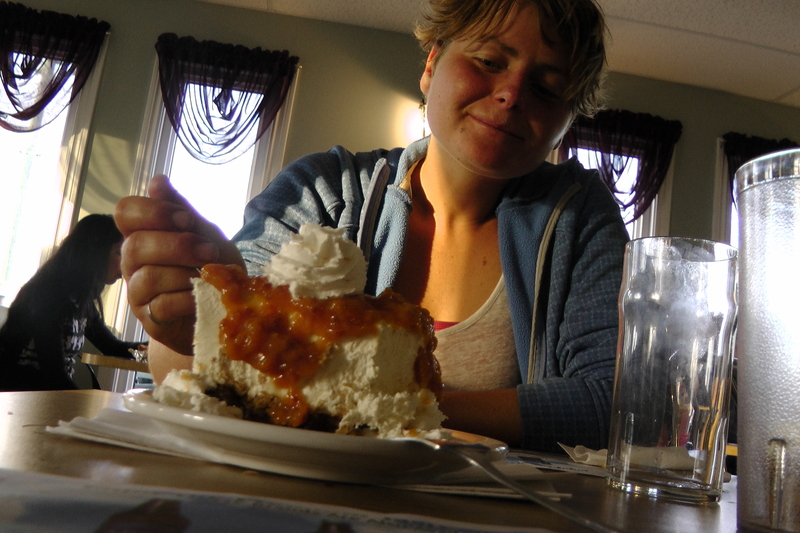 After eating a hearty dinner, Maria had the audacity to mention that she’s on a mission not only to see a moose but also to taste one. In Ontario, we were told that it tastes really good. Bridget happened to have some at her house! So that’s what we ended up eating for breakfast. It tastes very similar to beef. The moose that we tried at Bridget’s had been given to her daughter by a friend who hunted the moose. Hunting moose is neither easy nor cheap. First, you have to win the license lottery and purchase a license. Then, you need to shoot a moose and transport it out of your area. And finally, you need to have the moose butchered, which usually costs money. Last year, Bridget says, moose hunting was allowed in the parks as well, but nobody wanted that license because you were not allowed to use a truck to pick up your dead moose: just muscle power! Bridget said that her daughter only eats organic meat or non-farmed fish. Thanks to her daughter, Bridget has switched to a pescetarian diet herself, and avoids eating farmed fish because of the health risks of eating a fish brought up on an unnatural diet. But you won’t find Atlantic wild salmon in the supermarket: commercial fishing for salmon is not allowed here anymore because the stocks have been depleted. A personal fishing license only allows the holder to catch 6 salmon a year. With that kind of limitation, people tend to ration out their salmon for special occasions like holidays or birthdays, instead of mindlessly munching on it daily. Salmon are not the only over-fished species: trout and cod stocks are also low. Bridget said that the cod stocks were depleted because of insufficient regulations as well as too much foreign fishing in the nearby waters. For many people here, cod fishing was their livelihood. But before you rush to ship parcels of food to your Atlantic friends, don’t worry! There are new iconic Newfoundland foods: moose and unique local berries. Mmmm. Bakeapple cheesecake — delicious and unique local flavour. 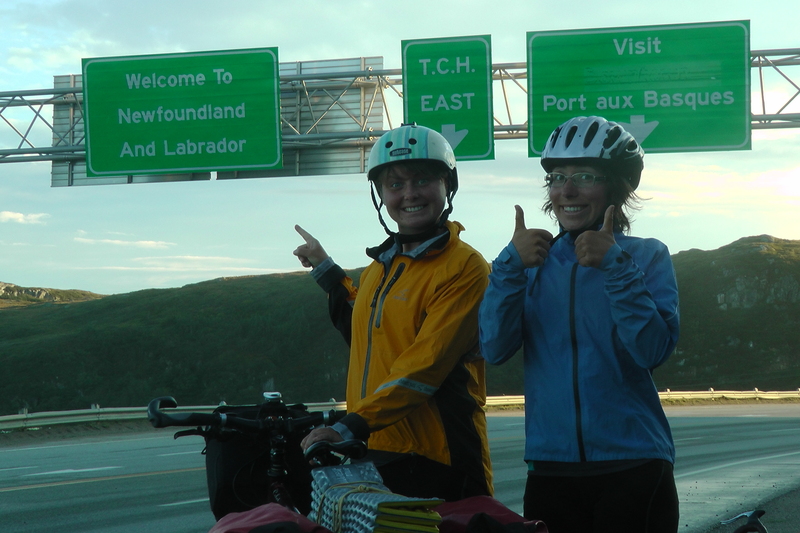 The day we hit our 8,000km mark we also arrived on Cape Breton Island. 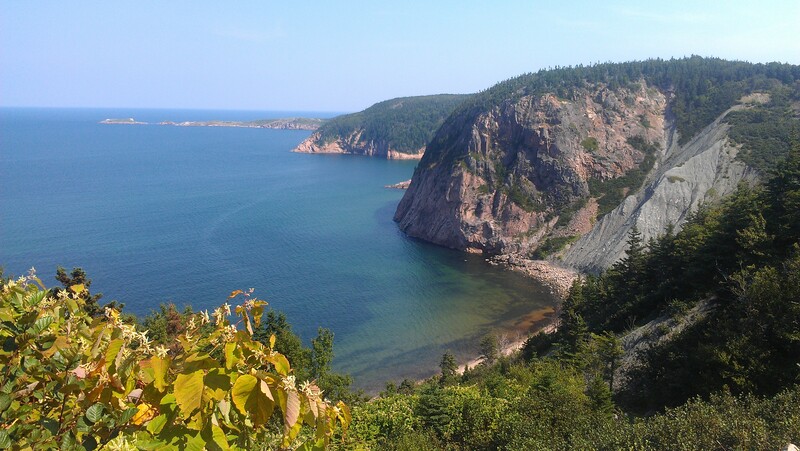 The highway loop around the northern part of the island is called the Cabot Trail. Like Anya’s bike, it is named after the explorer John Cabot, who set sail from England over 500 years ago. After risking his life and enduring great difficulties, Cabot (probably) found this beautiful place. Today, getting here still poses a challenge for the cyclist: the loop is famous for its steep hills as well as its breathtaking views. In the clockwise direction, the most intense climb is North Mountain, with a 13% grade for 3km and a total elevation gain of 445 metres over 4km. Although it was possible to avoid this loop en route to Newfoundland, we accepted the challenge on our quest for rugged coastlines. 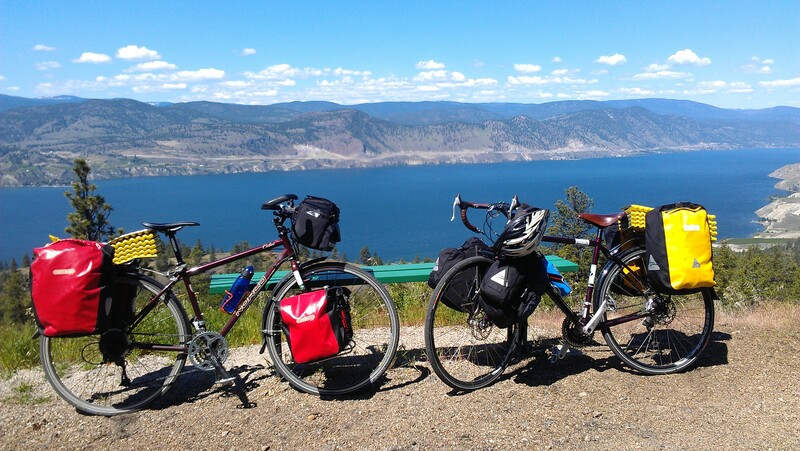 We started out on the scenic Trans Canada Trail along the coast. 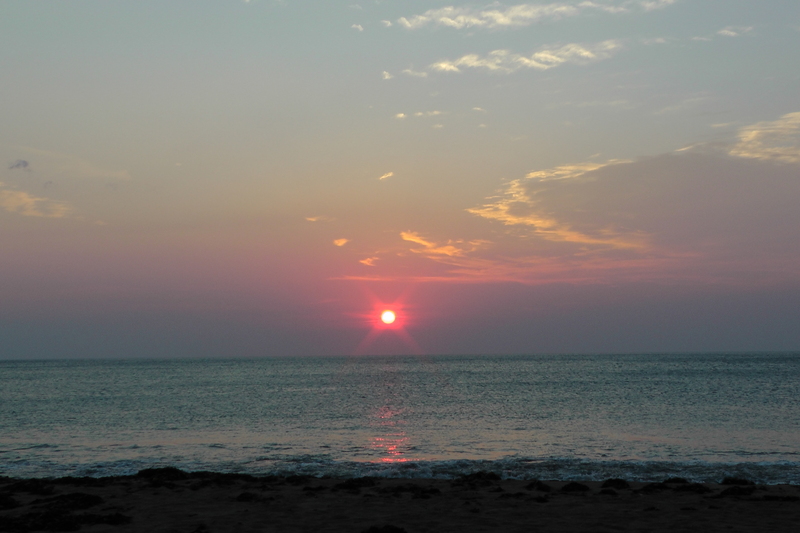 In Judique, we camped on the beach without setting up a tent. It gets quite windy around here. When we tried cooking on the beach, the lighter wouldn’t light, so we had to take it to the sheltered picnic table, where it worked just fine. We made a mental note to buy some matches at the first opportunity, just in case the lighter was running low on fuel. Luckily, the next day our Warm Showers host, Kevin, cooked us a warm dinner with freshly caught mackerel. Kevin goes fishing for mackerel in his kayak practically every day. He says it’s a very cost-effective vessel. Though it lacks some of the comfort and reassurance of a sailboat or motor boat, and the locals think he’s crazy, Kevin loves fishing out of the kayak. He strives to enjoy life without excess, so that he doesn’t need to work a job that causes a lot of stress and takes away all his time. A lot of people, he says, work and save until they are old and unable to enjoy their savings, or they buy useless things just to be like the neighbours. The mackerel feeds Kevin both directly and as a bartering item: he trades his homemade smoked mackerel for fresh organic vegetables with a local farmer. To reduce cost on other things, he hunts thrift stores and garage sales for quality and unique household items. Kevin told us about the limited work opportunities here. Tourism and fishing are the big ones and they’re seasonal. During the winter, an overwhelming number of people rely on unemployment insurance. Many people leave to work elsewhere, especially in the tar sands, where they earn big money. But Kevin wonders whether they are able to control their materialistic urges when they are suddenly given so much freedom. The next day we summited two mountains, including North Mountain. 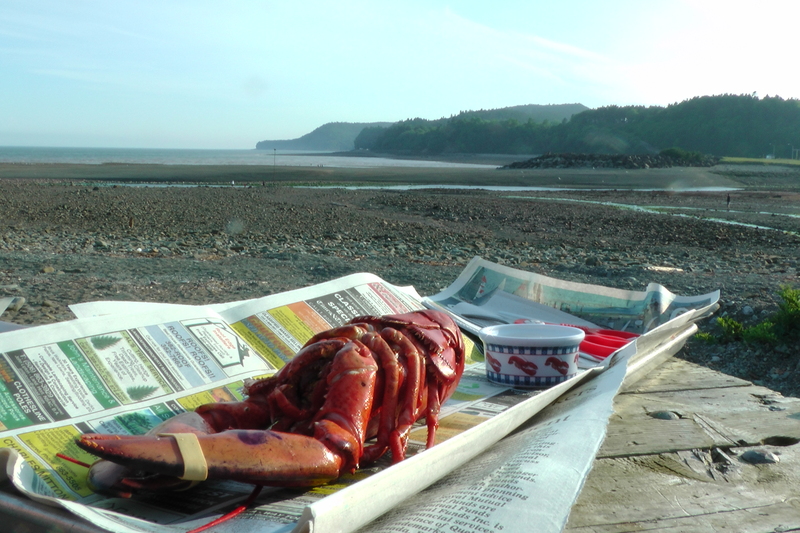 We arrived in Cabot’s Landing and got ready to cook dinner on the beach. Again, the lighter was not cooperating. Of course we hadn’t bought any matches. Anya, who is not a big fan of pasta, suggested that perhaps a salad for dinner would do just fine. But Maria was outraged, and managed to light the stove just by using the sparks from the flint in the lighter. That’s what happens when you desperately want a warm dinner! In the morning we woke up to see the sunrise and walked along the big spit closing off Aspy Bay from the Gulf of St Lawrence. 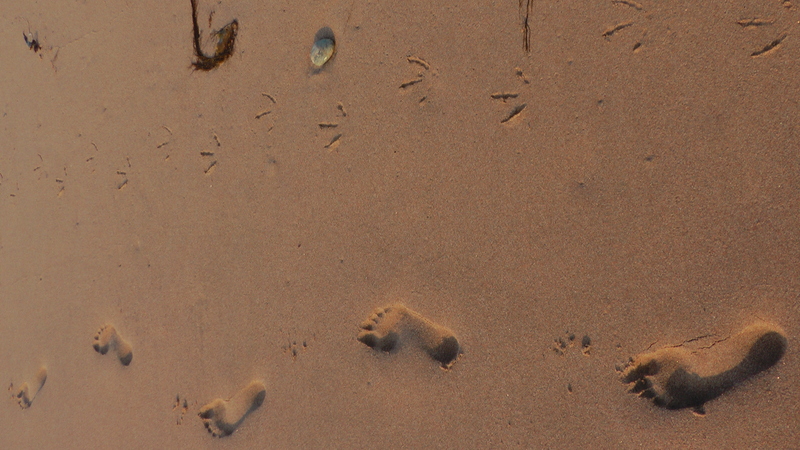 We found some birds. We swam naked. 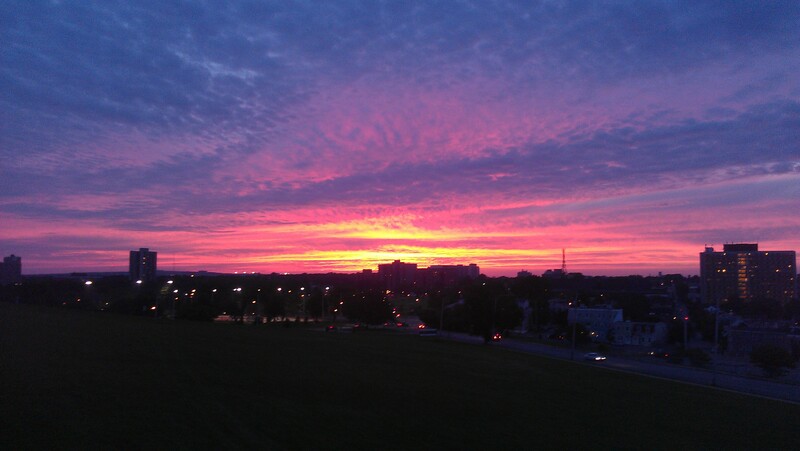 It was pretty. After cycling a long 15km, we stopped to feast on the deservedly famous fresh oysters on the half shell at Hideaway Campground. Continuing our seafood mission we took an ‘alternate scenic route’ (aka, hilly detour) off the Cabot Trail. We suffered on the uphills, but were generously rewarded. Stopping at the Chowder House was a particularly sound decision: we ate crab, clams, scallops, prawns, haddock, and mussels. We were rather late getting to our next Warm Showers host, Rosie. Her friend, Mary-Beth, was visiting from Newfoundland. 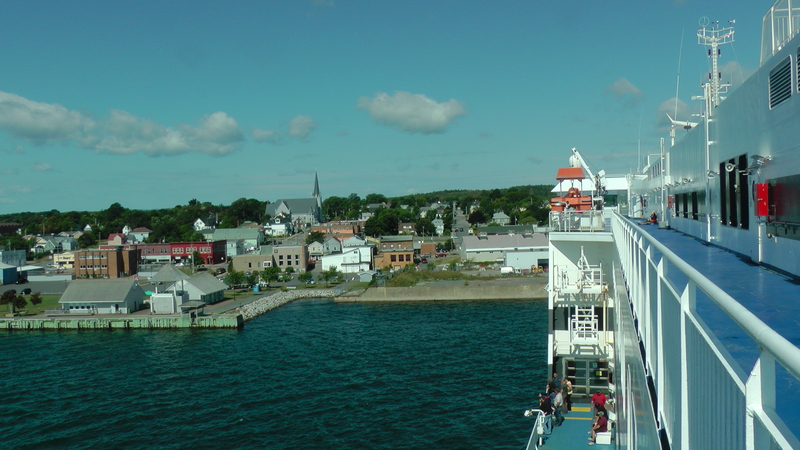 Mary-Beth told us about the ferry trouble that had been happening since the previous weekend: one of the two ferries was out of commission, causing overbooking and delays. 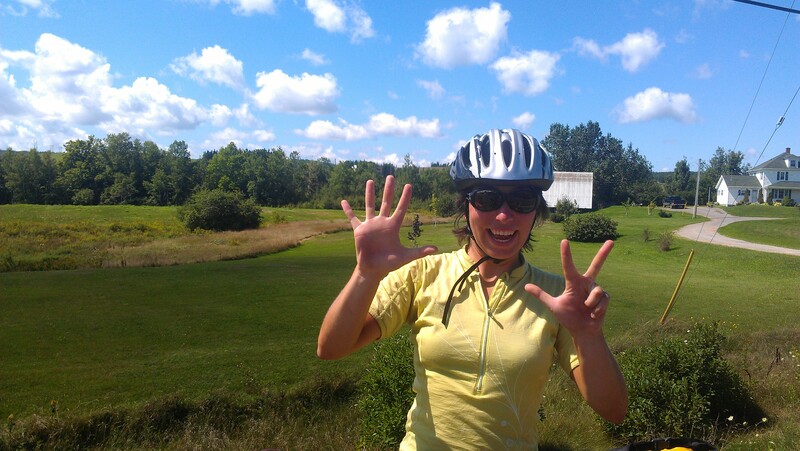 We checked on the internet, and sure enough, the following morning was booked solid, even for cyclists. The next available space was not until two days later. So we were forced to take a rest day the following day. After all those steep hills, it wasn’t such a bad thing. Rosie’s house has a composting toilet. Yep, inside her house. There are haiku instructions for how to use it and following them, we were able to set its wondrous mechanisms in motion ourselves. What an experience. Rosie also keeps pigs and chickens, and grows vegetables. Her pigs will reluctantly eat store-bought animal feed, and they will not eat Rosie’s vegetable scraps which go in the compost. But they love the fatty or doughey food scraps, like the ones Rosie gets from the nearby cafe. It’s her first year of pigkeeping and she’s been pretty successful so far. But the big challenge lies ahead: she’s going to ask for help in killing and butchering the pigs in exchange for gifts of knitted things and bacon. On our unexpected rest day, we visited a bookstore, conveniently located next door to Rosie’s. The store owner played his fiddle for us. He said the young people aren’t learning to dance, although fiddle music is meant for dancing. 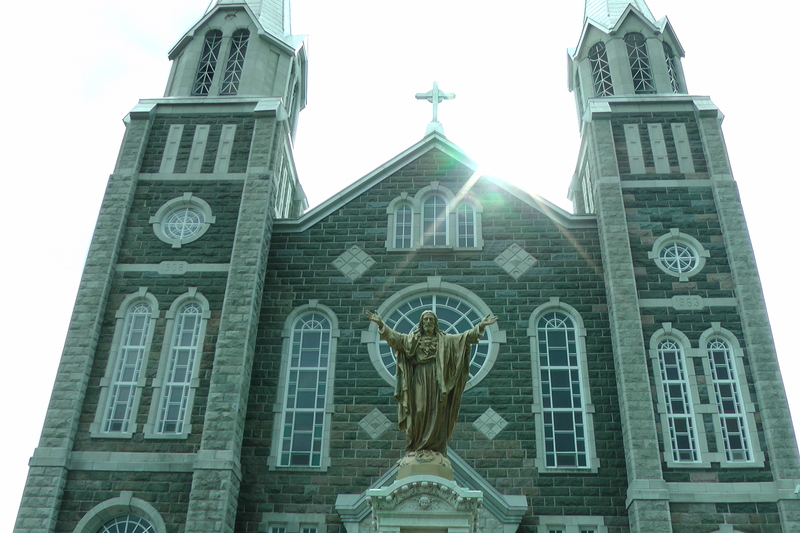 Later, we went to hear some local fiddlers in the nearby church. Sure enough, everyone was stomping their feet but both the audience and the performers were an older crowd, and nobody was dancing. In an effort to keep their Celtic heritage alive, Cape Bretoners added the Gaelic town names to the English ones on all their highway signs. Oh, Canada, land of many cultures and heritages. Most people are confused enough by place names derived from French and various First Nations languages — and now this? Here’s a pronunciation guide. Cycle touring is great because you often stay in rural places. Our St-Vallier hosts, Dany and Maïté, live in a part of town that’s not even connected to the town’s water supply. The house’s water comes from their well, but it’s not pleasant to drink because of a light sulphur odour. Many people purchase expensive filtration systems, but Dany and Maïté make trips to the nearby woods where there is a natural spring, and get their drinking water from there. Just what we needed after a full day of cycling in the sun! Maïté has a beautiful vegetable garden in their backyard. She grows variety of veggies including some extra large and very tasty zucchinis. She was full of creative ideas for her garden. 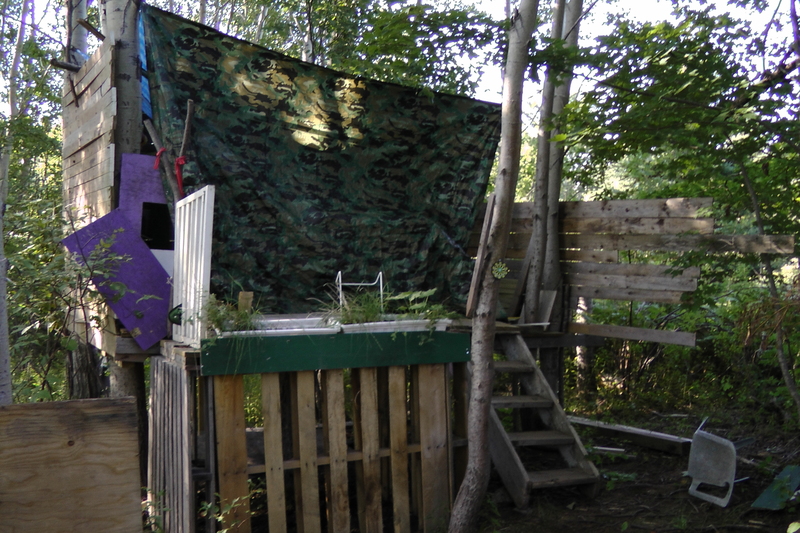 Maïté figured out a three-stage compost system that’s suitable to their house. First, they collect the compost in a bin. Once the bin is full, usually after a year, they transfer it to a raised bed; this year, she planted some zucchinis and geraniums on it for aesthetic appeal. After another year, the ready compost goes into the garden. The family does without a lawnmower. In the spring, they buy some rabbits and set the rabbit cage on the grass. Once that area has been ‘mowed’ they move the cage to the next area. In the fall, they eat the rabbits, although their 5-year-old son, Matéo, doesn’t know that yet, but is starting to catch on that the rabbits each year are different and it makes him sad. They also do without herbicides for killing dandelions, and in the early summer their lawn turns bright yellow. Instead of stressing about it and working against nature, they enjoy it. When you come to a small town on a weeknight, you don’t necessarily expect a beach party. 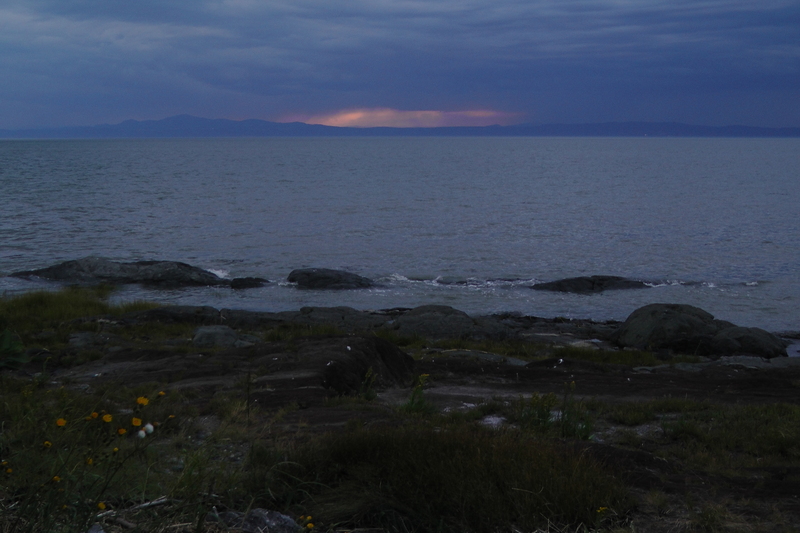 But that’s what we found in Kamouraska. 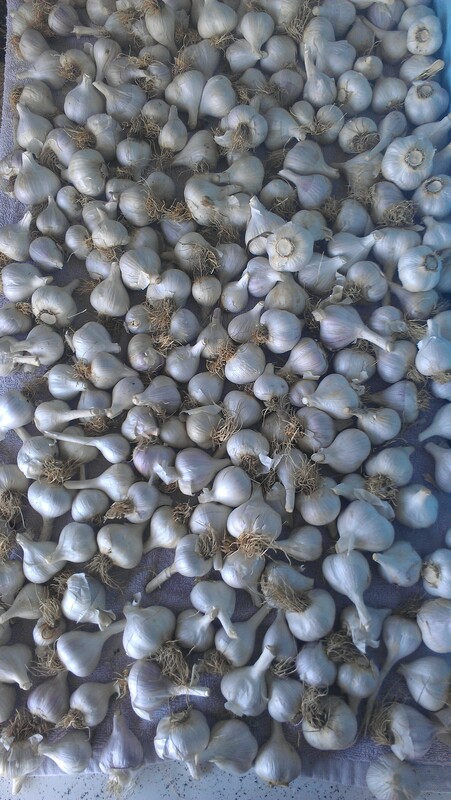 Our hosts, garlic growers from the nearby St-Germain, were celebrating a friend’s birthday, and we were invited! At the afterparty, we talked to Jesse, who works for Greenpeace. 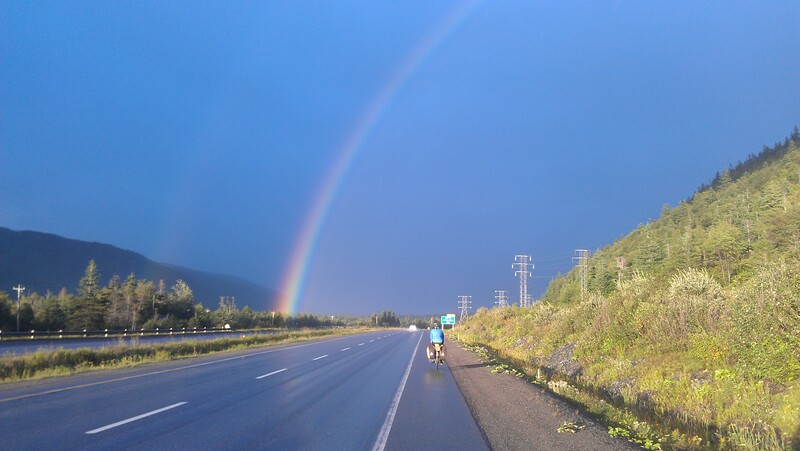 He is cycling around Quebec with a colleague, encouraging people to get involved with Greenpeace. Many people have been very receptive and welcoming, he tells us. However, in Canada people are reluctant in having convesation about the environment: many of them have jobs in industries like mining or oil extraction that are damaging to the environment. So they feel a bit guilty or responsible and do not want to get themselves into a conversation where they will be blamed or accused. One of the friends had recently butchered his goat, and some of its meat was roasting over the fire. Our conversation naturally turned to food. Jesse had grown up on an organic farm, where fresh, organic meat was a big part of his diet. When he moved away, he realized that grocery store meat is not nearly as good as what he had been eating all his life. He gradually learned to eat mostly vegetarian and stopped buying meat. But Jesse does not promote strict vegetarian diets: he likes to challenge vegans and vegetarians on their values. For example, can a vegetarian eat roadkill, which already died anyway, and is going to waste? One day Jesse would like to learn to hunt. He says if people got their meat hunting, they would better understand the value and ecological context of the meat they were eating, and would adapt their diet accordingly. 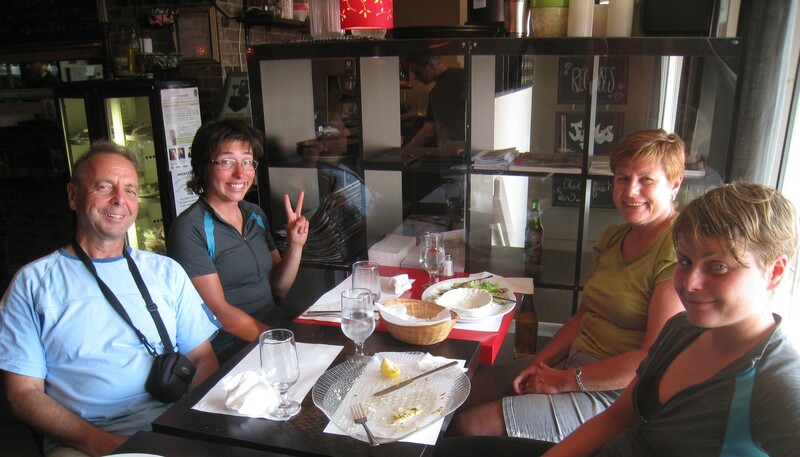 After two culture filled rest days in Montreal, we stayed with Cedric and Anika in Joliette. Cedric works at the farm market and gets fresh local vegetables, which we got to try in the form of tasty homemade quiche by Anika. The farm market is unusual because people order their food online. On pickup day, the farmers bring the requested goods to the market, and people come to pick up their orders. As Cedric explains, this helps the local economy and in particular, the local farmers. What better way to get to a car race than on a bicycle? 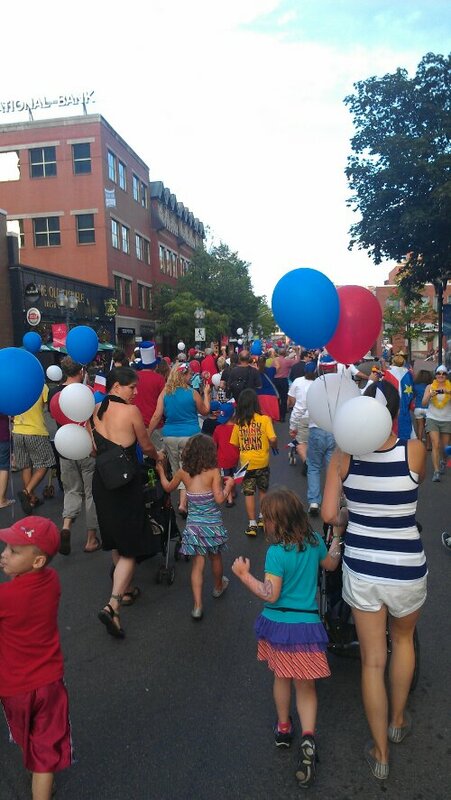 We arrived in Trois-Rivières just in time for the Grand Prix, and the sound of racing cars created a constant background noise during our stay. Our hosts, Sharon and André, were not very pleased with the route of the race track, as it passes between the seniors’ homes and the hospital. In response to hearing about the Tour de Sustainability project, Sharon told us a story she read in the paper. 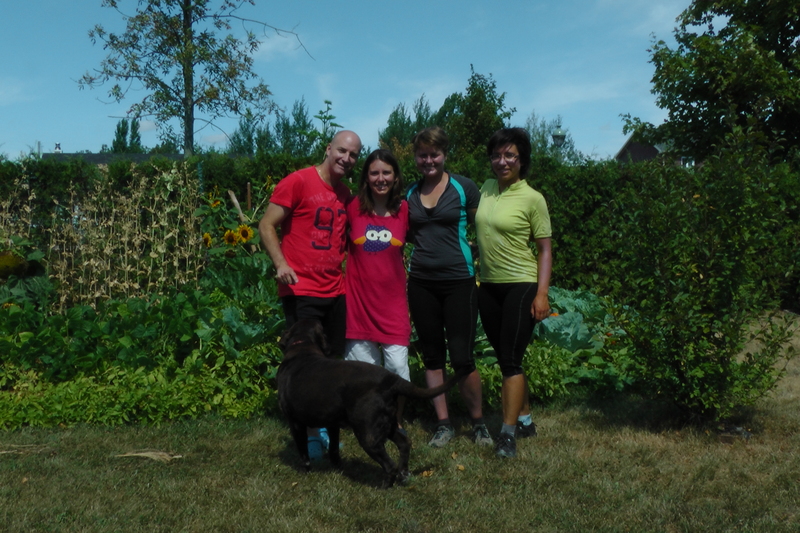 In Drummondville, a couple decided to grow their own vegetables to start eating healthier food, and the only place sunny enough was their front yard. After a season’s worth of hard work, they set up a wonderful garden. But the municipality has a law requiring 30% of the front yard to be grass, so they were told to remove the garden and put back the lawn. The couple is fighting with the municipality for their garden, but the prospects are grim: the municipality is planning to introduce a law banning all vegetable gardens in front yards. The story seemed to have gone viral, and a lot of our hosts had opinions about it. As Sharon and André said, the people who had vegetable gardens in their backyards sided with the couple: to them, a garden is a beautiful thing. But the others sided with the municipality. Dany, our St-Vallier host, suggested that the ridiculous law is due to conformist mindsets. To some people, it’s just important that everybody’s house and front yard should look the same. Thanks to Anya’s parents, who came to visit for the long weekend, we were able to go sightseeing in various places along the north shore of the St. Lawrence. 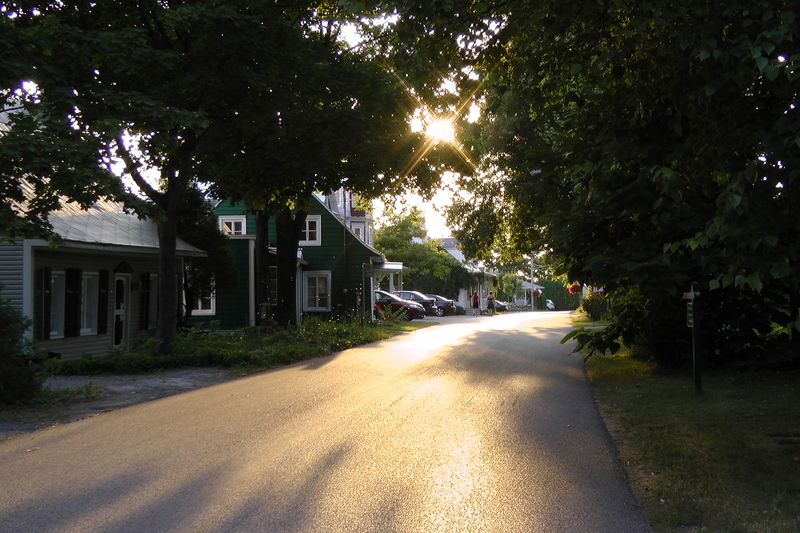 We saw Quebec City, Portneuf, and one of the oldest streets in North America. We also enjoyed some of the produits du terroir (French for local food). For example, we discovered the ground cherry (cerise de terre) at a fruit stand, and found it very addictive. We also tried ground cherry liqueur, which was almost as delicious.